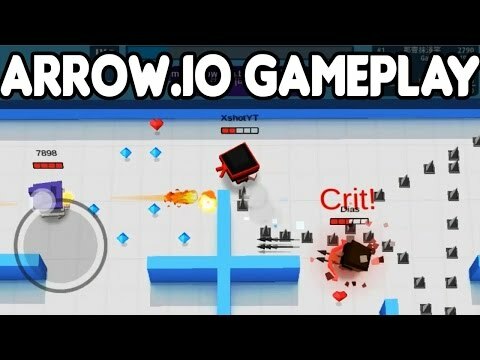 Arrow.io mobile game is a free-to-play online arrow shooter game that was released in December 2016 for iOS and later for Android devices. The multiplayer. IO game belongs to the categories of Action, Shooter, Shoot-Em-Up, Top-down and was developed by Cheetah Technology Corporation Limited. The player plays as Pixel Man and aims to defeat all other players who are also playing all around the globe in arrow-shooting battles. As a player, you fight to survive by aiming your arrows as opposing players as well as bears. At the same time, you’ve got to be careful and take care not to be hit by opponents. As you do all these, you should be collecting as many diamonds as you can. When you launch the game for the first time as a new player, you need to provide a nickname for your character. After that, you select the mode of the game that you want to play in. The mode you select can either be Limited-time Championship, Offline Game or Online Game. The next step is to get into the first Arena known as the Beginner Arena. Next, before you get into battle, you get to select a skill. You then get to face the opponents henceforth. The Arenas in the game include Beginner, Masters, Firestorm, and Midnight. Each and every player must take part inarching in Arrow.io. The player is provided with a bow and arrows. These must be used wisely and sparingly in aiming and shooting down all the opponents. Your movement around the map must be done in a clever way. Once positioned, the player is to get out their bow and arrows quickly and ensure you shoot the enemies before they can destroy you. The main focus here is to ensure you take out as many opponents as possible just by shooting them with the arrows. In case you get hit by the arrow of an opponent, your game gets over and you’ll have to begin afresh. While battling the enemies, ensure you earn as much gold as possible and always focus on your survival. In order to climb from the Beginner Arena to the other Arenas, you must reach the targets of the previous arena. This is the main weapons that a player must use to shoot and kill opponents in the quest to continue surviving. They must be used sparingly ensuring that they are not wasted. The game has three main modes that one can play in. These include Limited-Time Championship, Offline or Online game modes. The arenas here are the Beginner, Masters, Firestorm, and Midnight. The player must progress in this order, starting with the Beginner Arena. The setting of the game is such that it allows several players around the world to engage in multiplayer battles with one another. The game allows you to upgrade your skills so that you can end up surviving in the whole game. The gameplay of Arrow.io has been praised substantially by those who love arching games. It’s an epic game that keeps most players glued to their screens.